Practically every camcorder records two channels of audio, which allows you to record in stereo (Left/Right) or two discrete channels (1/2). Lately I’ve been using the Sennheiser Evolution G2 wireless a lot and it started to bother me that I was only recording one channel from the wireless reciever into the 3.5mm stereo plug on my little camcorder. I was not making use of the second channel, and an audio channel is a terrible thing to waste! 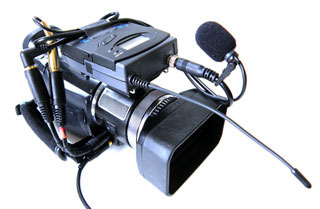 Often I like to hear what’s going on with another subject who might be close to the camera and far away from the person wearing the wireless, or simply to get clean audio of the interviewer for one reason or another, and a second microphone in the vicinty of the camera offers a solution. Now with larger camcorders that have XLR inputs I simply run the wireless into one channel and the second microphone into the other channel, but what about when you’re using a wireless that has a 3.5mm mini-jack output and you’re plugging into a camcorder with a 3.5mm mini-jack stereo input? For this situation I took a Y headphone adapter cable I had laying around and rewired it so that I could run two separate mics into the 3.5mm stereo input, one routed to channel 1 (left) and the other to channel 2 (right). If you are not inclined to cut, solder, and heat-shrink your own concoction, you can purchase a ready made cable, for example, the Cables Unlimited AUD-3010 8-Inch 3.5mm Stereo M to Dual 3.5mm Mono F Splitter is available from Amazon.com. For use with the wireless microphone as a second microphone in the vicinity of the camera, I purchased an inexpensive plug-in powered omnidirectional microphone from Giant Squid Audio Lab. They can provide you a microphone with custom cable lengths, the one I’m using is one foot long to avoid having to dress cables. Unfortunately a foam wind screen can’t be purchased along with the microphone, so I had to order a Pearstone 1/4″ foam wind screen from B&H photo video, it fits the microphone perfectly. I also use a Rycote Lavalier Windjammer on my lavaliers on windy days. Below is is a video I put together quickly that demonstrates capturing the audio from both the wireless microphone and the small omnidirectional microphone attached to the wireless receiver cable on top of the camera. Some things to notice in this recording, there’s two parts, Demo 1 and Demo 2. For Demo 1 I cross faded between the wireless microphone and the wired microphone, note the difference in background sound between the two mics. For Demo 2 I mixed the wireless microphone and the wired microphone, the overall noise level is higher. Whenever you have two different microphones, you’re going to get different background ambient sound. In this case, the fact that the wireless is clipped onto the subject’s shirt provides a very different sound perspective than a wired onmi attached to the camera. The mic on the camera is getting reverberation from the hard walls all around. The wireless mic, given the placement on the subject’s body, is only recording reverberant sound from 1/2 of the room, the close proximity to the body and the soft shirt is really cutting down on the overall ambience, and, give the close proximity to the voice, it also has the gain at a lower setting, so you are getting more signal and less noise. You are also picking up the speaker with both the wireless and camera mic, so now you have two perspectives of that voice in Demo 2. Nonetheless, a second microphone close to a second sound source that you want to record will result in a better recording that simply depending on a single wireless microphone. Again, each mic was recorded to a discrete channel. This offers more versatility in post. The editing and audio mixing was done with Final Cut Pro. An audio quality note: the video embedded in this page has been compressed to Flash with not the best audio compression settings, if you want to better hear the difference between the microphone positions and the ambient noise differences, go to the blip.tv page (UsingBothChannels859.m4v) to listen to the original QuickTime file that was uploaded to blip.tv. This splitter cable is also handy if you’re running two wireless microphones into the camera and want to run one into channel 1 and the other into channel 2. In order to mount two Senneheiser Evolution G2 wireless receivers on a single cold shoe adapter, the Rycote Hot Shoe Extension comes in handy, I keep one in my sound kit. Whenever possible, make full use of both audio channels! You will truly appreciate it when you’re editing your piece, and this is one of many techniques for making good use of of both channels. If you wire your own adapter, the tip of the mini-connector corresponds to the left channel, the ring corresponds to the right channel, and the sleeve is ground. It’s always a good idea to double check your wiring with a continuity tester. If you’re cobbling an existing cable with molded plugs, usually the wires are color coded with white corresponding to the left channel, red to the right channel, and black to ground. But you never know, still a good idea to double check with a continuity tester. Special thanks to Kyle Brock who graciously allowed me to videotape him for this and the original purpose of the video. Sennheiser Evolution G2 wireless microphone system generously provided by Professional and Continuing Education at MassArt. I use the same mic, but a different setup, and a different camera. I use the XLR cable that comes with the Sennheiser and put it into channel one and have it record on both channel one and two. This works when the interviewer’s voice is not heard, as it is with my work. Your approach is perfect for the interviewer who needs to be heard. In this case I usually use a second mic (as you did) but XLR that one into another channel. Thanks for the demo. Larry, good comments, I sometimes run two separate mics into the two XLR connectors on the XLR adapter that came with the camera (it’s a Sony HVR-A1U) or into the two XLR inputs on the Panasonic HPX170 (the camera I’m using for my current documentary project), however, when I’m using a tiny camcorder, or the A1U in “small as possible mode without XLR adapter” mode, this strategy provides a very light and compact way to bring a second mic into the situation. Even if I’m not going to use the interviewers voice, it’s sometimes nice for the editor to hear what the interviewer said. This is one delightful feature of the HPX170, it records the camera mic audio into Channels 3 and 4, which is very useful in many situations, like hearing the interviewer close to the camera, or picking up general stereo ambient sound. I wish more cameras recorded four channels, and that Panasonic offers a way to route external audio into Ch 3 and 4 in future prosumer offerings. David, I also use a HPX170, and have shot with two LAV mics, when not using the camera mic at all. Here’s my question: is there ANY way to splice in a third LAV? I’m working with two interviewers and I’d like to be able to put both of them and their subject on a LAV for optimal sound. The HPX170 basically has two XLR inputs mapped to Ch 1 and Ch 2 and the camera mic is mapped to Ch 3 and Ch 4. If you want to run a third Lav to the camera, one way to do it is to use a Mixer. I use a Sound Devices 302 mixer with three inputs and two outputs. This makes it easy to mix three sources. For example, Lav 1 could go to Ch 1 and Lav 2 and Lav 3 could be mixed to Ch 2. Since DVCProHD supports 4 channels, it’s a shame Ch 3 and 4 could not be input to the camera in some way, even a mini input would have been nice.